Mean Green Mowers launched the ReVolt, an all-electric dual drive wide-area walk-behind commercial mower. The ReVolt is an all-electric 48- or 52-inch cut dual drive wide-area walk-behind commercial mower. 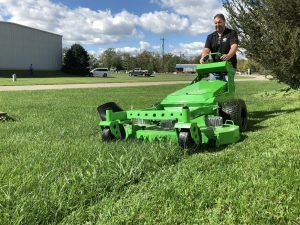 It comes with the option of two Green Monster battery packs that get commercial lawn care contractors through a full day of mowing on one charge, according to the company. The packs are designed to be low-slung and super wide so they hover 8 inches above the ground. This allows the ReVolt to hug slopes with fewer worries from loss of control and oil starvation that is common with Internal Combustion Engines, the company said. Offering 24 hp, the 48-volt battery charges completely after 4-10 hours. Designed to offer a low noise level, the mower emits 76 db(A) on the 48 inch and 78 db(A) on the 52 inch.